“Streets for People” is a series of articles focusing on Louisville’s street design, written by Bicycling for Louisville Executive Director Chris Glasser. The goal of the series is to encourage a (polite and civil) online discussion of the topics from the articles. Please see the comment form below to respond and let us know what you think. In last week’s article, I made the argument that, because Louisville’s transportation system is set up to move cars as efficiently as possible, we have sacrificed our ability to get anywhere in any other way — by foot, bike or transit. Examples abound of destinations in our city that are practically inaccessible by any other means than by car — Waterfront Park, the airport, Churchill Downs, the suburban malls, the Fairgrounds. It needn’t be this way. Yes, our streets serve a practical purpose, but they can (and should) serve an aesthetic, collaborative and creative purpose as well. Their effectiveness should not be based solely on an engineering equation that maximizes driving efficiency. To use a metaphor: streets are a city’s nervous system, though, they’re too often thought of simply as a its circulatory system. By making driving our city’s most convenient means of transportation, we’ve not only incentivized driving (an unhealthy and costly habit in and of itself) but also created a huge demand for parking (an unsightly, unhealthy, costly habit all its own). After all, what’s a convenient drive without a convenient place to park? While one can forgive the suburban malls or the airport for not being walkable, this need for parking has had a disastrous effect on our downtown. Our urban core is riddled with surface parking lots that are undermining our ability to create a vibrant, active, urban shared space: the kind of place that brings people together — which is, after all, the primary purpose of every city. Much has been made of the city’s “9th Street Divide” — the supposed invisible racial line that separates black Louisville to the west from white Louisville to the east. The city’s segregation (and inequality) is a matter of fact, but the “9th Street Divide” is a fallacy — or at least, a simplification of a broader, more complex idea. What we have, actually, is a crater of surface parking lots in our western downtown, creating a void in what could be a thriving city center. Here’s a map of downtown, with the surface parking lots marked from 9th to 3rd streets (government-maintained surface parking lots are in green — note for later). What one notices are the four blocks south of Jefferson and five blocks west of 5th Street — the sheer volume of space given over to surface parking lots. This area, even at lunchtime on a weekday, is desolate. Main Street and 4th Street also stand out. There are no surface parking lots on either, except for a sliver here (6th and Main) and a sliver there (4th and Guthrie). Not coincidentally, Main and 4th are our most walkable downtown streetscapes — brimming with people coming in and out of museums, restaurants, shops, hotels and offices. Their wide sidewalks and curb extensions at intersections invite people out onto the street and encourage cars to slow down — a contrast to the crater of surface parking lots to the south and west. While 9th Street’s over-engineered highway ramp and roadway certainly don’t help things, it’s this gulf that separates our downtown from the residents to the west. And it’s this gulf that serves our auto-dependence — making parking cheap and accessible to anyone who wants it — while undermining our downtown’s vibrancy. A map of the surface parking lots south of Broadway paints a similar story. The two blocks between Broadway and Breckinridge are littered with them — there’s hardly anything else, save for some historic structures along Fourth (Presentation Academy, the original Spalding College building, and the main branch of the library). The whole area is a dead zone. What to do about this problem? A development at Market Street and 7th Street in downtown offers an example of one potential solution. Previously a surface parking lot, it is now a development for an eight-story hotel. As a Broken Sidewalk article from last year reported, “the hotel will forego its own parking, instead opting to partner with the Parking Authority of the River City to fill an underutilized garage around the corner at 120 South Sixth Street.” The city should work to encourage more projects like this. 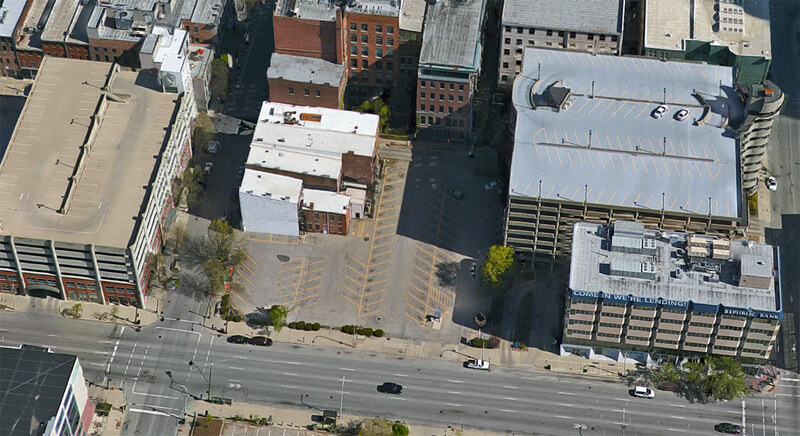 Another suggestion: The city should seek development proposals for the surface parking lots that it owns and operates for its employees in western downtown. The block-size lots encompassed by 8th-Jefferson-9th-Liberty and Market-7th-Congress-6th represent great opportunities for mixed-use development that would encourage walkability and downtown vibrancy. The last suggestion I’ll offer is one that both Mayor Greg Fischer and Councilman Brandon Coan (among many, many others, I’m sure) have discussed as well: redevelop the old Louisville Gardens site. Surrounded on all sides by surface parking lots, redeveloping this site would enliven the west downtown dead zone and incentivize development among the adjacent surface parking lots. As with our first article, I invite you to write in with your own suggestions to address this problem. Below is a map of the surface lots in western downtown (you can use the legend to turn on the parking garage layer). We’d love to hear your ideas for how Louisville’s surface lots could be reimagined as vibrant, active, urban space.